No. Not that laundered money. Whenever laundry gets done around this casa, I usually find a lot of coin in that circular-spin-drum-thingy, after the spin cycle. It gets deposited into the guilty pleasures frog bank that sits on the file cabinet in my office. Because it’s my guilty pleasure. A couple of years ago, I pulled this from the c-s-d-t after the spin cycle. Five bucks, baby! Sir Wilfred Laurier is looking stern. We will have no fiscal cliff here. I love our money. See the cute hockey players? So. This has been sitting on my desk for two years now. At least. I can’t throw it away. It’s money. It won’t fit in a coin wrapper. What to do. 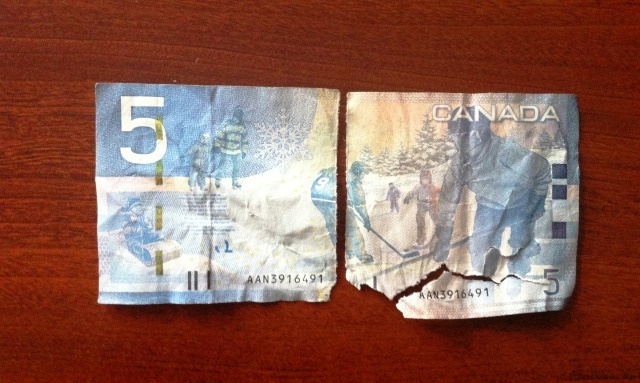 Do you think I can tape it together and spend it? Do you think Starbucks would take it, because I could really use an Americano about now? What about the convenience store? A Snickers bar wouldn’t go unappreciated. In fact. Now that I’ve typed Snickers bar, I really want one. I need a Snickers bar. 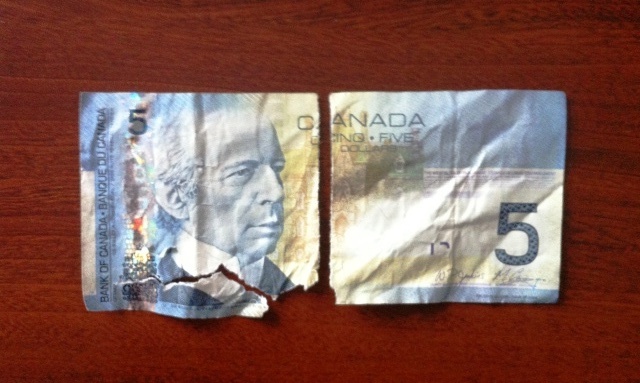 One torn, wrinkled Canadian Five Dollar Bill for a Snickers bar. Word on the street is that they’re being replaced by a small, tasteful coin. 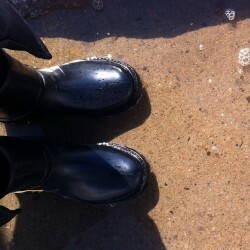 We’re starting the week with a blog quickie.